Canadian School Libraries has created a suite of resources outlining the positive influence of school libraries on student learning. The resources were compiled as a response to a recent news story about a new school being built in Nunavut without a school library. 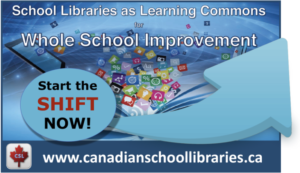 Access the resources through the Canadian School Libraries website. Canadian School Libraries is looking for input from school libraries/librarians across the country: How do you plan on keeping your students engaged in reading, thinking, and making over the summer? CSL plans on including the feedback in the Spring issue of CSL Journal. Have some ideas to share? Fill out the google form! In order to make Canadian school library scholarly research more accessible, CSL has launched the Canadian School Libraries Research Archive. Click here to connect to a searchable database of papers and presentations from past Treasure Mountain Canada research symposiums.